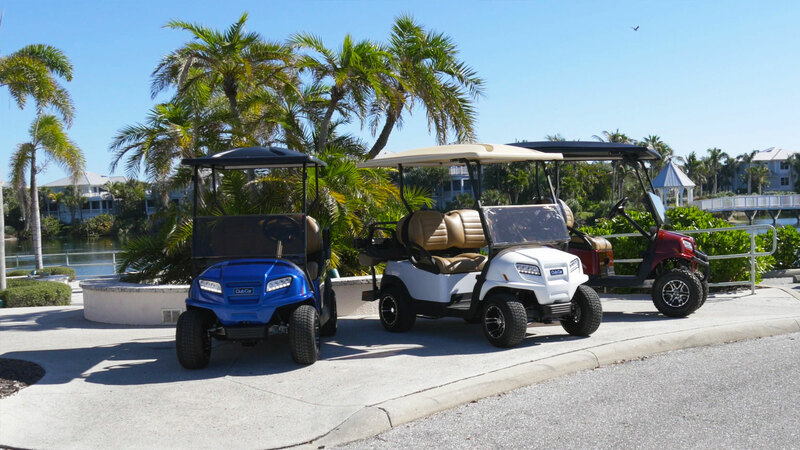 It’s time to get out and enjoy this fabulous Southwest Florida weather Enjoy it even more in a new Golf Cart from Caddy Carts. Whether it’s a 4 passenger for cruising the community, LSV, or a 2 passenger for the golf course; Caddy Carts has it all! Caddy Carts is your one stop authorized sales and service dealership representing Club Car, Garia, Polaris, and StreetRod. We invite you to come down and browse our large selection of new, used and factory remanufactured carts. If you don’t see what you are looking for we will custom build it or special order it! We serve the Tri-County area to include, Venice, North Port, Englewood, Boca Grande and beyond! Call 941-474-4747 Or visit our showroom today!! For more information ask in store or Click Here. Caddy Carts, the areas AUTHORIZED dealer for Club Car, Garia, Streetrod, & GEM. Family owned and operated for over 20 years. Caddy Carts is a full service dealership with certified technicians and a very knowledgeable staff. Being longtime residents of the area, Caddy Carts is always willing to lend a hand in the community; look for our donation carts and sponsorship throughout the community. Keep in mind Caddy Carts has been your licensed LSV dealer servicing the tri county area since 1998, factory certified for all four brands to handle any of your golf, recreational or LSV transportation needs. Come visit our showroom, one red light South of River Rd. on US 41. Working with a Factory AUTHORIZED licensed dealer will be well worth the drive!!! 2018 © CADDY CARTS, INC.